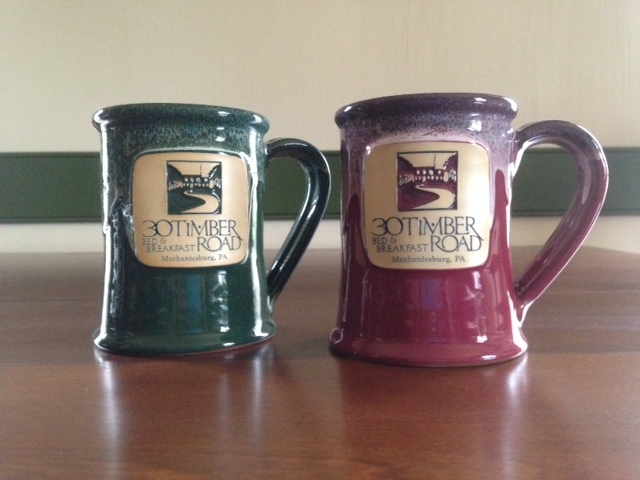 New mugs for 30 Timber Road Bed & Breakfast from Deneen Pottery. This is our first spring season in our new 30 Timber Road Bed & Breakfast home. One of the fun things about living in a new place is that we discover something new every week (almost every day!). On a recent walk through the woods I saw some buttercups, snowdrops, and some pretty white daisy-like wildflowers. I also saw some May apple plants (aka umbrella plants) peeking up through the forest floor. We have lots and lots of daffodils blooming along our wood lines. Other bulbs ready to bloom in our gardens include hyacinths and tulips. We will be planting more bulbs this fall too. We’ll see what comes up for later color in the gardens. Speaking of spring – the Car shows will soon start in Carlisle! The Spring Carlisle Collector CarSwap and Meet will be held April 23 – 27. Our first open dates for car show will be in August for Corvette at Carlisle happening August 22-24. Make your reservation now for this Carlisle tradition! We have been stocking up on supplies for our new B&B. We received our first shipment of Deneen Pottery mugs! These mugs fit your hand well and hold the heat so you coffee or tea stays warmer longer. As we finish our renovations, we will be posting pictures of each room. All of our rooms will have a king size bed and all guest bathrooms have a whirlpool tub. Our many (many) years of experience as innkeepers and our dedication to continued education in hospitality will help us make sure to provide everything you need for a wonderful stay at 30 Timber Road Bed & Breakfast. Hi Dee! So nice to see things coming along ~ wishing you the best and a Happy Easter too! I have to post more pictures – we got carpet, I put up the curtains, and the new bed arrived for the Magnolia Suite! That room is almost ready for pictures! Happy Easter to you and Dennis & the boys. What a beautiful B&B this will be, yet this is no surprise given the wonderful hosts, Chuck and Dee who will welcome us all with their hospitality. We are looking forward to our first of many visits after the opening of 30 Timber Road in August! And of course, there will be the Deneen Pottery mugs without which no B&B is complete! Thank you David & Jeannie! We look forward to seeing you at our new B&B. You must add our new mugs to your collection!